Regular bail is granted to a person after he is arrested by the Indian police for a crime he is suspected to have committed. When the police receive a complaint and if they have gathered sufficient evidence which will support their arrest, they arrest the suspect and he is remanded in police custody for further investigation and after that suspect sent in judicial custody. In the case of a regular bail, the person may approach a trail court, Sessions, High or Supreme Court to be let out of prison until the trial has concluded. A certain amount of money or assets are pledged to the court by the accused and based on this surety, the Court may or may not grant him bail. The condition is that the person must be present for the trial when they commence and are on-going and will not flee from the country or unduly influence other people associated with the trial. If the Court finds that the accused is not trustworthy and may not appear for the trial or may commit further crimes while out of prison on bail, it has the authority to refuse the bail. The sums pledged to the court in exchange for the bail are set at different levels for different people. The amount is mainly decided on the severity of the crime, the financial status of the accused and other facts related to the case. When a person suspects that he/she may be arrested for a non-bailable offence under the false charges filed by another person or legal entity, usually a bail is arranged for beforehand. This is an anticipatory or preventive move and is called an anticipatory bail and is obtained before an arrest is made. So the difference in these two types of bails lies mainly in when they are applied for by the lawyer. 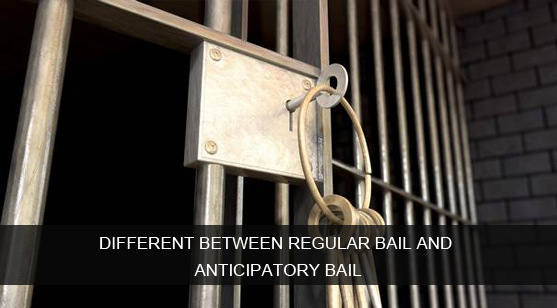 While the anticipatory bail is applied for and granted before an arrest is made, the regular bail is applied for and granted after an arrest is made and the accused has spent some time in jail.